Updated: added reference to image. Verizon Wireless today announced that the Motorola Droid RAZR HD and RAZR MAXX HD (pictured) will be available online and in Verizon Wireless stores starting October 18. The RAZR HD will cost $199.99 and the MAXX HD will cost $299.99 on contract. The Droid RAZR HD will be sold in black or white with 16GB of internal storage. The MAXX HD will be sold in black with 32GB of internal storage. Motorola is gunning to take down the competition with the RAZRs redux. Phone Scoop tackles everything you wanted to know about the Droid RAZR HD and Droid RAZR MAXX HD in this full review. 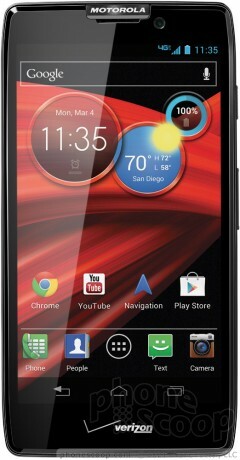 Motorola and Verizon Wireless today announced the RAZR HD and RAZR MAXX HD. Both phones run Android 4.0 Ice Cream Sandwich with a Jelly Bean update planned to reach them before the end of the year. who would spend the extra for the maxx? The phone world is rapidly breaking down into price points separated by $100. Taking into context the RAZR M, RAZR HD and RAZR HD MAXX, MOT has the $99, $199 and $299 price points covered.